April 24–30th marks Fashion Revolution Week. This is the fashion industry’s chance to show what it’s made of and champion meaningful change. Fashion Revolution and its message extend beyond brands and their responsibility to operate in a fair, safe and sustainable way; the idea is to galvanise us – the human consumers of the world – to play our part, vote with our wallets and clearly signal who we will support and what we will not accept. No longer can we sit idly, happily buying our cheap, trendy things at the cost of others and our planet. 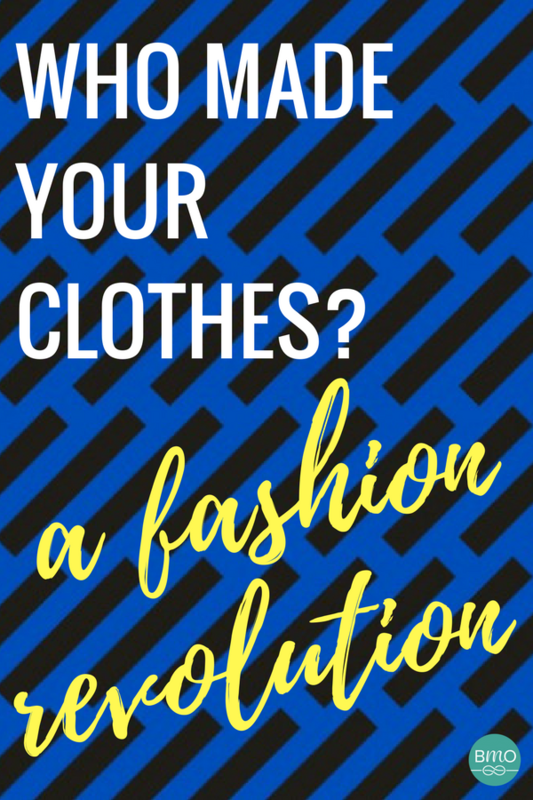 Fashion Revolution is a not for profit organisation calling for significant global change through “greater transparency, sustainability and ethics in the fashion industry”. How our clothes are sourced, produced and of course, purchased needs a radical overhaul. By engaging customers and brands to participate on social media and in a range of events, Fashion Revolution challenges us all to ask #WhoMadeMyClothes? The idea is to shine some serious spotlight on supply chains and to engage brands to answer #IMadeYourClothes. There can be zero doubt that Fashion Revolution’s mission is crucial and one that BuyMeOnce is fully behind. The #WhoMadeMyClothes campaign has certainly raised awareness and inspired people to talk and communicate around this less than comfortable topic – and yes, it’s definitely true to say that many brands are engaging and answering that all important question. Last year over 70 000 customers asked brands the question and over 1000 brands replied. This was an enormous improvement on the previous year (448 percent to be precise). Sparking this conversation and engaging both brands and people is a great start. But is it enough? Can it really do what needs to be done to reform this behemoth industry? Fashion Revolution tells us it’s getting down to work with policy makers in the UK and Europe to figure out how “government can support transparency”. This week saw Fashion Revolution’s Head of Policy, Sarah Ditty, lobbying the European Parliament to legislate against worker exploitation. We applaud this. Following Sarah Ditty’s work, MEPs voted and the European Parliament passed the resolution meaning that positive law-making should not be too far behind. Accountability should not be optional and industrial interests and the interests of humans and our environment cannot continue to collide. Government has to intervene; the blend of individual action and institutional weight is the real unlock and what’s needed if this mission is to succeed. 1,129 people tragically died when the garment factory at Rana Plaza collapsed in 2013. A further 2,500 injured workers were rescued from the wreckage. Exploitation in the industry has too long been a dark and devastating secret. Garment factory workers have consistently faced appalling working conditions such as excessively long shifts, sexual harassment and no job security. They are rarely awarded fair wages or basic rights such as safe conditions in which to work, the result of which came catastrophically crashing into public consciousness when, in 2013, the Rana Plaza factory in Bangladesh fell to ruins killing over 1000 of the employees working within. Four years on, has enough progress been made to ensure that not only will this never happen again, but also that garment workers everywhere are respected and protected by their employers as well as the brands they supply? According to Fashion Revolution’s white paper on the subject, following the Rana Plaza disaster, The Bangladesh Accord (an organisation started with the sole purpose of reviewing factory conditions) has inspected over 1200 factories, closing over forty and improving others in the process. This is a welcome beginning, but this is just one country. What about the countless others that supply the industry? What about the impact on the planet? As our Earth Day article pointed out, “the fashion industry is the second most polluting industry globally”. In 2016, global consumption of textile products was approximately 73 million tonnes and may continue to grow at around 4 percent to 2025. On average, only around 20 percent of textiles are recycled every year – this amounts to an extraordinary level of waste before we’ve even begun to consider the chemicals used during production processes. If you take a moment to think about the span of the industry and the fact that humans wear clothes every day, it’s not difficult to become overwhelmed by the scale of the issue. Yes, this all sounds bleak, but we humans are powerful creatures and there is much that we can do. We need to look up from our screen-fuelled existence and think a little more deeply about the choices we make and their impact on the planet and the humans we share it with. We can be curious, we can be demanding, we can cut ourselves off from the temptations of fast fashion and the horror that lurks behind the shiny shop front. So what have we at BuyMeOnce been doing to participate and get involved this Fashion Revolution Week? We’ve been delighted by the movers, the makers, the visionaries and the retailers who are championing change in our very own hometown of London. We’ve visited Bourgeois Boheme’s pineapple pop up shop – a tribute to all things pineapple which celebrates their latest vegan shoe collection crafted from Pinatex (a fibre made from pineapple leaves, a by-product of the fruit’s harvest). These shoes are the result of sustainable production practice and flawless, enduring craftsmanship speaking right to the soul of BuyMeOnce values. Look out for the shoes on our website; the brand is one of our most recent additions. We partnered with a local store – this week you hopefully saw our Instagram collaboration with the Keep Boutique in London’s Brixton Village. Kate Richards, the store’s founder and owner, fills her jewel of a shop and her website with carefully curated sustainable and immensely desirable treasures. From covetable pyjamas to wear-with-everything jumpsuits, each piece is ethically made and crafted with unfailing expertise for the finest quality. This boutique and everything it holds stands for the very best the industry has to offer. Check out our short film on Facebook to get a behind the scenes look at the boutique, meet Kate and hear what inspired her to bring this incredible and unique place into our lives. And we’ve added a range of new products to our site, highlighting the brands that are going out of their way to make durable fashion more ethical. From shoes to sewing machine, check them out at the bottom of the page. As the week winds down and the promise of the weekend draws near, Fashion Revolution continues to gather pace. There are so many ways to get involved – one or several of the many brand pop ups, swap shops and vintage fairs and immerse yourself in an organisation lead talk or screening. But more than anything, always question and hold the brands you wear to account – ask them #WhoMadeMyClothes? If they can’t or won’t answer, you’ll know it’s time to seek out the ones that will.